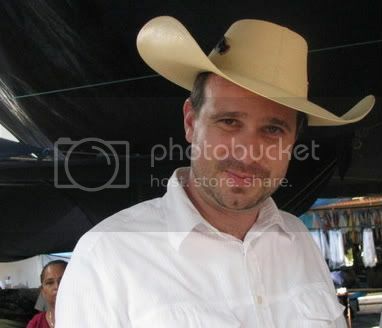 LUVIANOS, Estado de Mexico--Jeremy tries on a sombrero in the Tierra Caliente region, where a lightweight, bendable hat is not only traditional but also necessary. Hat makers use palm leaves to weave an intricate and high quality sombrero that costs about $1,500 USD. It takes months for one hat to be completed, and then lasts a lifetime. But for campesinos or farmers who work the land for a living, a hat like this is a life saver. Some campesinos save for years and years to afford this luxury. While younger generations prefer a baseball cap, older farmers wear their sombreros with pride. Some young men, though, see how necessary a hat like this is to battle the region's intense heat and create new styles and ways of wearing the sombrero. They are reinventing a tradition in order to keep the sombrero alive. That's a great photo of tu esposo!